Now that we embark on 2018, its a good time to look back and review what happened in real estate for 2017. As a whole, real estate flourished in 2017, spurred by low mortgage interest rates, high demand and a relatively low supply of homes on the market. Although 2017 was a good year for just about everyone, what were the hottest real estate markets for 2017? Back in January of 2017, Trulia released their list of the 10 hottest real estate markets to watch for 2017. Around the same time, Zillow released their hottest real estate markets for 2017. Although Zillow owns Trulia, the lists were quite different. There was one consistency between the two lists — both were full of coastal real estate markets. 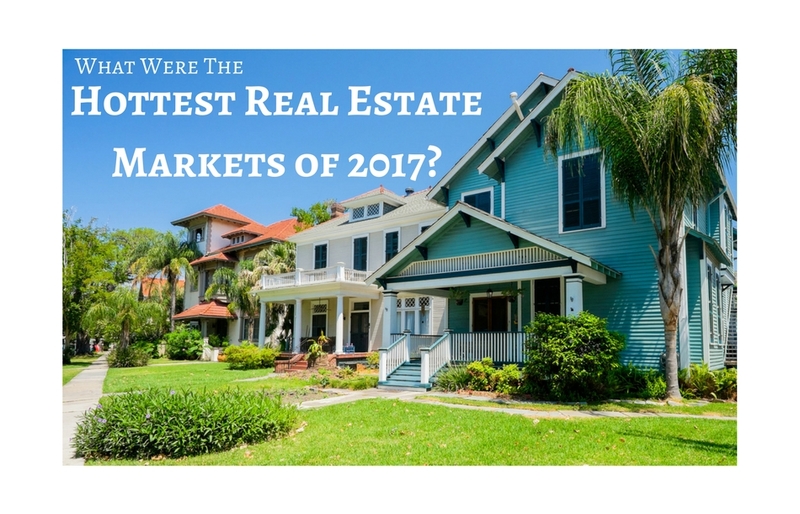 Realtor.com consistently puts out their list of the top real estate markets too. It is easy to come up with different lists for the top real estate markets – it depends on which real estate statistics you choose to look at and how you weight them. Baltimore economist Anirban Basu said he is optimistic about the economy in 2018, but suggested a breaking point may be coming in the years ahead. Maryland has added jobs at a rate that outpaced all but six states, businesses are growing, and consumer confidence is high. The Sage Policy Group CEO pointed to possible real estate and stock market bubbles, lagging wages and rising business costs associated with employee benefits and health care as factors that could slow growth in 2019 and beyond. As consumer confidence rises, people are spending more and saving less, pushing the consumer savings rate to a 10-year low of 2.9 percent. Basu spoke at the Maryland Bankers Association’s First Friday, an annual event that offers the state’s banking community a financial and economic outlook on the year ahead. A record 57,788 single-family homes and condos sold across metro Denver last year, an increase of 2.93 percent form 2016, and ahead of the 2015 record of 56,062. The average price of a single-family home sold last year reached $480,140, an increase of 8.7 percent from 2016. The median sold price, the point where half the homes sell for more and half for less, was $410,000, an increase of 7.9 percent. Condo prices rose even more on a year-to-date basis, hitting an average sales price of $318,904 last year, up 10 percent from 2016, with a median sales price of $270,000, up 12.15 percent from 2016.